This issue of Suicide Squad is good, but really seems to go by far too quickly. Amanda Waller is now taking orders from her recent foe, Direktor Karla, the leader of the People. 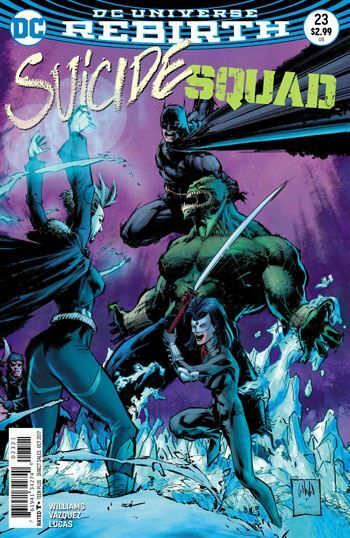 He has her use the Squad as a weapon against the new Justice League of America. 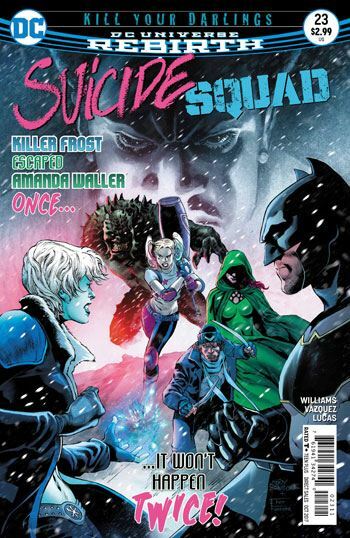 Killer Frost becomes the apparent target, although the team has no idea of Waller, and Karla’s, bigger game plan. I was pleased to see El Diablo return to the roster in this issue, although he spends his time being ill. Once again the humour is relegated to Enchantress and Croc, with Harley Quinn playing the hard edged straight role. Batman comes to the aid of Killer Frost. Both he and Waller have some tricks up their sleeves, so that’s all well and good. But the conversation between Batman and Harley Quinn feels very off. It’s as if this is not the same woman who is appearing in her own book(s). I guess that is an inevitable effect of the changes this series has put her through, but pitting her against Batman, after seeing such a different relationship only, like, a week ago in another DC book, just highlights how little this character feels like the “real” Harley. The only character whose behaviour actually grabbed my interest this time around was Katana, who is usually woefully under-written. About time something more was made of her. The story is really just a set up for what is bound to be a nastier conflict in the next issue. I am hoping, or guessing, that Waller is counting on Batman to get her out from under Karla’s thumb.